Congratulations on the arrival of Max...I bet you are all thrilled! He is such a cutie! Congratulations! He's beautiful. I've missed your recipes, but I don't blame you for spending more time with your new baby than with your blog! oh sabra! my best wishes for you! you folks did a great job. now you have a gorgeous new motive to shoot! He's soooooooo cute! Congratulations Sabra! Congratulations, Sabra! He looks so beautiful and serene. congratulations sabra. the most beautiful baby boy! Fabulous picture. I've wondered about you since your announcement. Then boom, there he is gorgeous. Is that a big dog in background? Now, that's a happy family. Bless little Max and your family. Sweet picture. Congratulations on little Max - he is adorable. He is just so handsome! congrats!! he is so cute!! I gave birth to my first baby girl the same time last year!! june 11 !! Congratulations! Now that's a reason to cuddle!! Hi Sabra - have lurked for a long time on your blog enjoying your photography and lovely writing tone. He is beautiful! 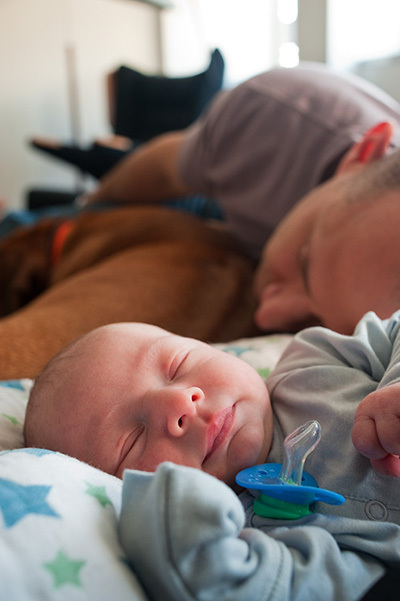 (love the picture with exhausted Daddy). I have a 3 month-old little girl so know exactly where you're coming from. I hope we get to see more glimpses of him as he gets bigger. Cheers. Congrats again, Sabra. Take care of yourself and all my best wishes for Max B. He is very lovely. Congratulations!!!!!! !